Asphalt shingles are ubiquitous. If you've ever owned a home then you've had them on your house at one time or another. Asphalt shingled roofs have been in use in America since 1901. They are durable for the price, affordable and come in many different textures and colors. Face it, we Americans love them! In this tutorial, let's take a look at some of the actions you can take to check and repair your asphalt shingled roof when it is near the end of its life. Over time, asphalt shingles begin to curl upwards or downwards (curling, cupping, clawing) as a result of improper installation, age, or environmental conditions. This is a serious problem and will require a roof replacement. A buckling shingle may be caused by the roofing installer not laying down a roof underlayment (roofing paper) on top of the roof decking. The lack of underlayment will cause moisture problems to the shingle and roof boards/decking. You can sometimes repair this problem for a short while gluing the shingle down with a bituminous roof sealant in a caulk tube, but it’s not a permanent solution. You’ll use a caulking gun, apply some roofing sealant to the curling shingle and push it down. You’ll then weigh it down with a brick for at least 24 hours. It’s best to do this kind of repair in warm weather, to ensure the glue actually sticks to the structure and doesn’t pop back up. In cold weather, shingles become more brittle; you run the risk of breaking the shingle when trying to curl it back down. As asphalt shingles age you may see them start to curl and cup because of sunlight, moisture, and changes in climate conditions. While you can repair some of them, it may be time for a new roof. You can only delay the effect for so long by gluing them down, so don’t wait until it’s too late to replace your roof. Apply bituminous roofing sealant under the crack. Press the shingle down and apply a second layer of bituminous sealant on top. If you find granules of shingles in the gutter from a recent rainfall or snowfall, you can spread them over the bituminous sealant to blend in your repair job. As with curled shingles, an excess of damaged shingles is a sign your roof will need to be replaced. Limited problem areas may be locally repaired. You should check to make sure the cracks aren’t so large that they’re piercing through into the roof deck underneath. You don’t want to make it easier for moisture to get through. Torn shingles, much like cracked shingles, are repaired by applying roofing sealant on the back part of shingle. Then you press together the two pieces of shingles that were torn and push them down to the shingle underneath. If roof shingles are disintegrating from age this is a serious problem and will require a roof replacement. If shingles are missing or are damaged by wind, hail or impact or other causes of environmental roof damage you will need to replace them. Hopefully, you have extra shingles on-hand from the original installation to use in such cases. Missing or damaged shingles need to be replaced with matching shingles. Keep the warranty for the roof in mind, because some might have specifications for how or what kinds of materials are installed over the existing roof. 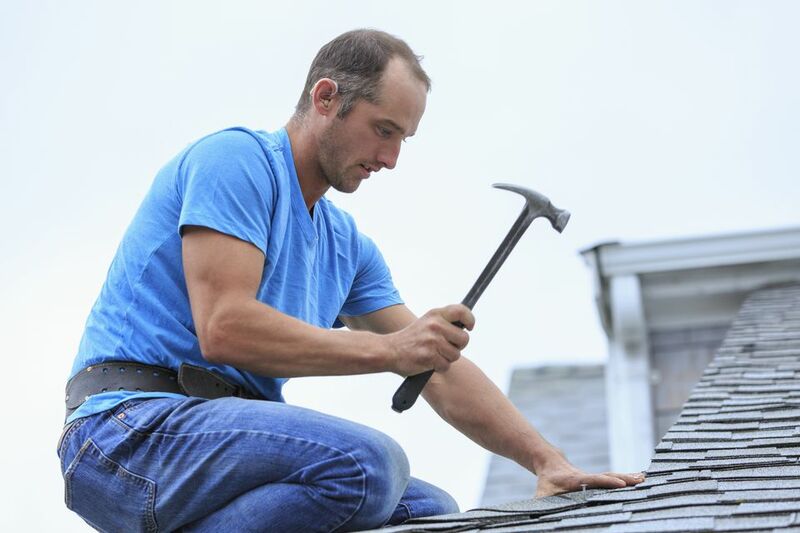 If your roof is still under warranty you don’t want to nullify your warranty with your DIY job, so you might want to consult with a professional roofer.